SoundMagic E50S review | What Hi-Fi? Sometimes it’s okay to make assumptions. 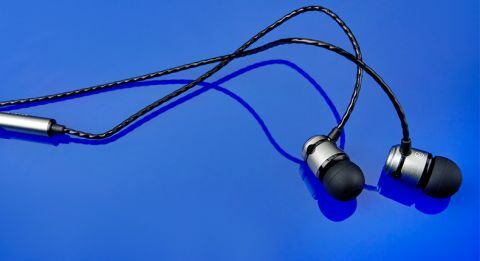 SoundMAGIC’s E10S were crowned champion of in-ears up to £50 at the 2014 What Hi-Fi? Awards. Surely, then, it follows that the E50S, ten notes dearer, ought be even better. Physically, they are not left wanting. The design – available in metallic grey, red or gold – is sleek and practical (the twisted cable stops them tangling and reduces noise). In case you were wondering, the ‘S’ stands for smartphone, meaning it comes with a canny inline mic that, thanks to an A/B switch, works with both Apple and Android devices. Understanding that a good fit is fundamental to the performance of an in-ear headphone, SoundMAGIC provides eight options of bud – including a pair made from Comply memory foam, like a mattress for your ears. There is no sleeping, however. Open with The Roots’ Get Busy and immediately you find the build quality is reflected in the sound. You almost feel for the drums as the kit pounds through the thick coating of grime laid down by the synths; the E50S capture the deep bass from the kick, the stab and bleed of the snare and crash of the cymbals, stretching the arrangement to make it sound at once full and gaping. That balance simply lets the aggression in the vocal come through naturally, tracking the sharp attack on each syllable. Attempt something more texturally and dynamically complex, such as Explosions In The Sky’s The Birth and Death of the Day, and the results are equally impressive. The opening chords are sparse and beckoning, the ritardando timing perfect, leaving you to anticipate the burst of the opening melody which splits like a chasm. The piece feels alive as it soars, gallops, then softly passes away. There is little to quibble about with the E50S; they are perhaps a little less expressive than Klipsch’s Reference R6i, but not enough to be a let down. The difference is small, and if that extra fiver overstretches your budget, a fine alternative.